Besides Hot Chocolate, McDonald's also sells Iced Chocolate as a McCafe menu item. Iced Chocolate probably more commonly known as your run-of-the-mill chocolate milk. It's $1.99 for 16-ounce small. Starbucks' Vanilla Creme Frappuccino is a frosty beverage for the non-caffeinated set and is pretty much a blend of vanilla syrup, milk, and ice. My local Starbucks had this at $3.75 for a 16-ounce Grande. For a limited time, Mountain Dew returns their Pitch Black flavor as part of their "Back by Popular DEWmand" initiative where consumer response spurred the return of the flavor for a limited time. I received two 20-ounce bottles of Pitch Black from PepsiCo for review but they normally cost about $1.69 in stores. They're not being stocked in all stores, so I'd call ahead if you're set on getting some. Crich "Wafers al Cappuccino" or Cappuccino Wafers come from Italy and feature multiple layers of light wafers and cappuccino creme. I found these at a local supermarket for only 99 cents(!) for an 250g or 8.8-ounce bag. Stouffer's fairly recently introduced some sandwich and soup options to their line of frozen foods calling it their "Corner Bistro" meals. The Steak & Swiss Melt with Broccoli Cheddar Soup features an herb-topped focaccia bread filled with steak, onions, and mushrooms in a Swiss cheese sauce paired with a broccoli Cheddar soup. The price is about the same as other Stouffer's frozen meals at $3.99 or about $2.00 to $2.50 on sale. 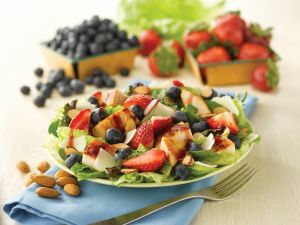 New at Wendy's for the summer, the Berry Almond Chicken Salad features fresh blueberries and strawberries atop a bed of fresh-chopped romaine and iceberg lettuce mixed with a spring mix joined by almonds, shaved Asiago cheese, grilled chicken breast and a fat-free raspberry vinaigrette. An entrée-sized salad is priced at $6.49 or $5.29 without chicken, and half sizes go for $4.49 or $3.89 without chicken. Jell-O Temptations are being marketed as indulgent relatively low-cal desserts for adults. Double Chocolate Pie is made with cocoa and features a layer of chocolate mousse atop a layer of chocolate pudding. I've seen these on sale for about $2.50 with a normal price of $2.99. Panera Bread's new Steak & White Cheddar Panini features seared top sirloin, caramelized onions, Vermont white Cheddar and horseradish spread served on French baguette. It's one of the priciest items on the menu at $8.99 with your choice of a side. Domino's latest promotion is the Early Week Pick-Me-Up Deal. Good for the next month or so, Domino's Pizza is offering a large, 3-topping pizza for $7.99 but only on Monday, Tuesday, and Wednesday and only for carryout. Deep dish and specialty pizzas are not included in the promotion. Dunkin' Donuts recently brought back their popular Waffle Breakfast Sandwich but with a twist: the waffles are now blueberry waffles! 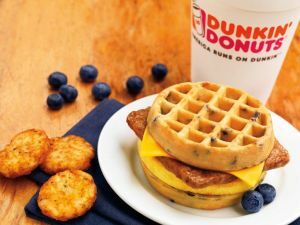 Dunkin' Donuts' new Blueberry Waffle Breakfast Sandwich features egg, maple sausage and American cheese sandwich by two blueberry waffles. The Blueberry Waffle Breakfast Sandwich is available for a limited time at participating Dunkin' Donuts restaurants nationwide for a suggested retail price of $2.99. 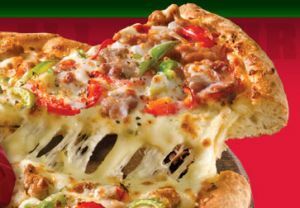 Papa John's newest specialty pizza is the Sausage Sensation Pizza featuring spicy Italian sausage, sweet sausage, smoked sausage, green and red peppers, and onions with Italian herb seasoning. The pizza is available for a limited time at a promotional price of $11 for a large. Jamba Juice's new summer Fruit Refreshers debut today but I got an earlier sneak peek and a 16-ounce sample of each new flavor yesterday courtesy of Jamba Juice. The new drinks feature coconut water to keep your hydrated and come in three flavors: Purely Pineapple, Strawberry Lemonade, and Tropical Mango. A 16-ounce cup normally runs for $3.90 at my local Jamba. McDonald's has three varieties of fresh-baked Cookies on tap for the snack minded at three for $1. They cover three of the most common cookies with Oatmeal Raisin, Sugar, and Chocolate Chip. I'll be contacting the winners shortly for fulfillment and thank you everyone for participating. For those of you wondering as to the final tally in the Arby's Chicken Salad Taste-Off, it came out to 8,820 votes for Arby’s version and 1,048 votes Subway’s version. New Ritz Multigrain Garlic Herb Crackerfuls feature 6 individually wrapped filled crackers for easy packing and snacking. Each filled cracker consists of two long rectangular multigrain crackers filled with a garlic herb cream-cheese-based filling. I found these retailing at a local supermarket for $3.89 or around $2 on sale. Arnott's Tim Tams are very popular chocolate cookies in Australia, where cookies are called "biscuits." An Original Tim Tam consists of two chocolate malted cookies sandwiching a light chocolate cream filling and coated with a layer of milk chocolate. I don't know how much they cost. I got a couple of packages from my Australian uncle when he was visiting the States for business. A 200g package contains 11 Tim Tams. This week's Frozen Friday brings us DiGiorno's new Cheese Stuffed Crust Pepperoni Pizza which brings stuffed crust pizza to the microwave. An 8.5-ounce pizza sells for $3.99 at my local supermarket or around $2.00 to $2.50 on sale. 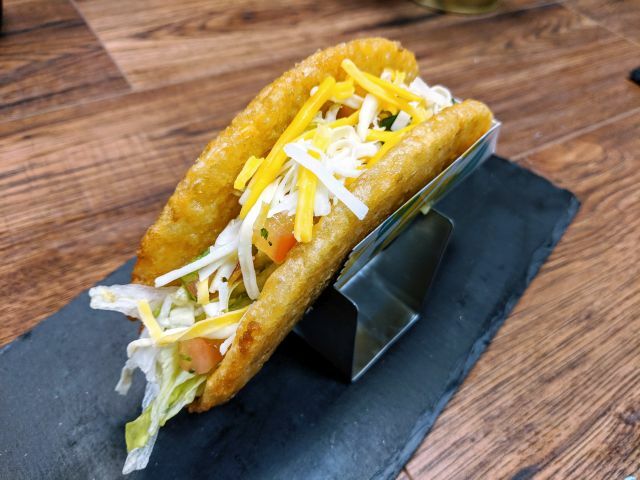 A familiar mash-up of various Taco Bell ingredients, Taco Bell's latest limited-time menu item, the Beefy Melt Burrito features seasoned ground beef, seasoned rice, their three cheese blend, and reduced-fat sour cream for an easy price of 99 cents. Tostitos Hint of Pepper Jack tortilla chips are stone-ground white corn tortilla chips seasoned with a bit of pepper jack flavor. A 13-ounce bag runs for a retail of about $3.99 which comes out to $2.00 to $3.00 on sale. One of Starbucks' new Petites, the Red Velvet Whoopie Pie features two small red velvet cakes discs sandwiching a cream cheese frosting filling. As with all Starbucks' Petites you can purchase one for $1.50 or two for $2.50 (unless you live in Alaska or Hawaii where it costs more). Jack in the Box's Bourbon BBQ Steak Grilled Sandwich is their latest limited-time grilled sandwich offering and features strips of steak, grilled onions and melting cheese covered with Jack’s new Bourbon BBQ sauce and served on grilled artisan bread for $4.69. Through June 4th, Pizza Hut is offering any carryout pizza (any size, any crust, any toppings) for $10. The only limitations are no double toppings and an additional charge for stuffed crust. Not a bad deal at all if you're willing to pick up a pizza instead of having it delivered. Shaved iced is quite popular in a number of Asian countries (with regional variants) as well as in some Asian enclaves here in the States. To date, it hasn't yet hit mainstream popularity i.e. it hasn't been "Pinkberried." Fluff Ice seems to be aimed at possibly changing that with their own take on shaved ice. Today's International Weekend product comes from the U.K. and has been around for a while (since 1885! ), Jacob's Cream Crackers. They're a bit like a cross between a saltine and a table water cracker. While a bulk package of six 200g (7.05oz) packages costs $18.00 on Amazon, I was able to pick one package for just 99 cents at a local supermarket. Apparently they're the "fastest selling" crackers in the U.K. The Asian-themed Healthy Choice Steaming Entrée, Sesame Glazed Chicken features chicken tenderloins with whole grain rice, water chestnuts, sugar snap peas and red peppers in a sweet sesame glaze. Like other Steaming Entrées, this 9-ounce frozen meal is generally about $2.99 or around $2.00 on sale. 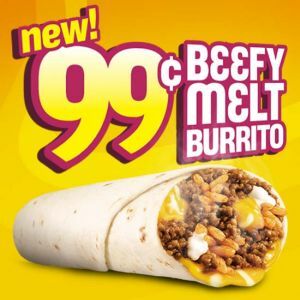 Taco Bell's newest, latest, limited-time item, the 99 cent Beefy Melt Burrito replaces the outgoing Beefy Crunch Burrito. It's a Beefy Crunch Burrito minus the Fritos and nacho cheese sauce plus a melted three-cheese blend. For those of you who missed that, it's a burrito with seasoned ground beef, seasoned rice, three cheeses, and reduced-fat sour cream. A very familiar mix at Taco Bell but hey, it's 99 cents! Since you can have them make your burger any way you like at In-N-Out, I decided to try an In-N-Out take on an old classic, the McDonald's Cheeseburger. I call it the In-N-Out Cheeseburger McDonald's Style. It's the same price as a regular Cheeseburger at $2.15. Returning this summer through early September, McDonald's Asian Salad is one of the more healthy options on the menu and features iceberg lettuce, Romaine lettuce, spring greens, edamame, red pepper strips, carrots, sliced almonds, mandarin oranges, and snow peas. The salad costs $4.69 with grilled or crispy chicken which is in line with other McDonald's salads. It is also available without chicken. Starbucks' Mocha Coconut Frappuccino is back for a limited-time at your local Starbucks and features coffee, your choice of milk, bittersweet mocha sauce, coconut syrup and ice, blended together and topped with whipped cream, chocolate drizzle and toasted coconut flakes. A 12-ounce Tall costs $3.95. 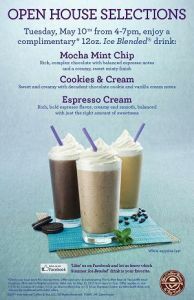 The Coffee Bean is holding one of their Open Houses today, May 10, 2011, from 4pm to 7pm at participating locations where you can get a free 12-ounce Ice Blended drink of your choice from three flavors: Mocha Mint Chip, Cookies & Cream, and Espresso Cream. "Mocha Mint Chip - Rich complex chocolate with balanced expresso notes and a creamy mint finish. Cookies & Cream - Sweet & creamy with decadent chocolate cookie and vanilla cream notes. Expresso Cream - Rich, bold expresso flavor, creamy and smooth, balanced with just the right amount of sweetness." It's Mountain Dew, only frozen. Well, more like slushied. 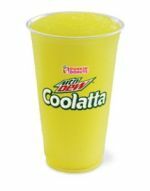 For a limited time, participating Dunkin' Donuts restaurants nationwide are offering new Mountain Dew Coolattas this summer for the suggested retail price of $2.29 for a small, 16-ounce drink. In conjunction with the new product, Dunkin' is running a rather odd promotion where up to 600 entrants a day get to control an ice blaster to unfreeze a Mountain Dew Coolatta Cup from a real block of ice to win prizes such as a Burton snowboard (isn't it summer? ), a DD card, and other stuff. You can check out the details on their Facebook page. Along with its new Blackberry Shake, Jack in the Box has a new, limited-time sandwich: the Bourbon BBQ Steak Grilled Sandwich. 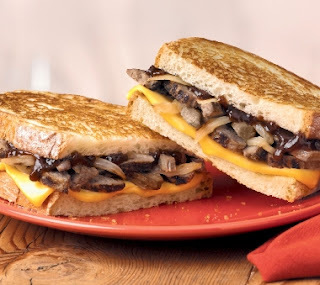 The new sandwich features strips of steak, grilled onions and melting cheese covered with Jack’s new Bourbon BBQ sauce and served on grilled artisan bread. Strangely the new sandwich is not available at restaurants in Austin, Houston and Kansas City. You can expect a price around the $4 mark (may vary). I was asked by Arby's to participate in their Chicken Salad Taste-Off to compare Arby's Grilled Chicken & Pecan Salad Sandwich (or wrap) with Subway's popular Orchard Chicken Salad Sub. As part of my participation, I was given a gift card to Arby's and another to Subway to acquire each review item. In addition, Arby's has graciously earmarked three $5 gift cards to give to three lucky readers (details at the end of this post). Pizza Hut's limited-time promotion for May is $10.99 for any large Lover's Pizza which represents a savings of $1.01 off their regular simple price of $12. Lover's Pizzas include the Ultimate Cheese Lover's Pizza (with Alfredo sauce topped three cheeses), the Pepperoni Lover's Pizza (with extra pepperoni and cheese, enough for every bite), the Meat Lover's Pizza (with pepperoni, ham, beef, bacon and sausage), the Cheese Lover's Plus Pizza (with lots and lots of cheese and your choice of two toppings), and the Veggie Lover's Pizza (with tomatoes, mushrooms, red onions, green peppers, and black olives). Pepperidge Farm's Gingerman cookies are different from the Gingerbread cookies they offer during the Christmas season. They're thinner and crisp rather than crunchy. A 5-ounce bag retails for around $4.09 with sales prices ranging from $2 to $3. Welcome to International Weekend, a new feature on Brand Eating highlighting vittles imported into the U.S. from other countries. First up are Forelli Sugar Topped Puff Pastry cookies which come from Italy. I was able to score a 7-ounce package for $1.59. A new addition to the Hungry-Man line, Popcorn Chicken with Spiced Rum BBQ Sauce features popcorn-shaped, breaded chicken patties with a spiced rum barbecue sauce, mashed potatoes, and green beans. Retail price is about $3.99 while sale price tends to be around $2.50 or less. I walked into my local McDonald's the other day and found out that they had tweaked their line of premium chicken sandwiches with (as the manager explained to me) a new bun and a lower sodium count on the chicken. Intrigued, I ordered a new Premium Crispy Chicken Club Sandwich for $4.29. The sandwich features a new crispy chicken breast fillet, tomato slice, bacon, natural Swiss cheese, mayo and leaf lettuce on a toasted bakery-style bun. Starbucks' Happy Hour event starts anew this year beginning tomorrow, Friday, May 6th, 2011 until Sunday, May 15th, 2011 between the hours of 3 and 5 p.m.
During the event, at participating stores in the U.S. and Canada, you can purchase any Frappuccino drink for half-price. The event first started last year as Starbucks promoted their However-You-Want-It Frappuccinos which allows customers to choose from a variety of milks, different intensities of coffee, and different combinations of syrups or toppings (with varying costs). A permanent fixture on the Starbucks' Hawaii menu, the Mocha Coconut Frappuccino has returned to the mainland for a limited time as summer begins to take off. The Mocha Coconut Frappuccino features Starbucks' signature Frappuccino Roast coffee, your choice of milk, bittersweet mocha sauce, coconut syrup and ice, blended together and topped with whipped cream, chocolate drizzle and toasted coconut flakes. For a more pure coconut experience, there's also the Coconut Crème Frappuccino Blended Crème which eschews the coffee and bittersweet mocha sauce. The Orchard Chicken Salad Sub is back for a limited time at Subway as May's $5 Featured Footlong. The perennial sandwich features a base of chicken chunks, celery, red apples, golden raisins, cranberries, a light mayo and your choice of bread and veggies. I tried it the last time it came around and you can check out my review of the Orchard Chicken Salad Sub here. Looks like McDonald's is rolling out their new Frozen Strawberry Lemonade for the summer if my local McDonald's is any indication. The drink features a lemonade ice slush with a strawberry flavored syrup swirled in. Prices start at $1.69 for a 16-ounce small to $1.99 for a 20-ounce medium and $2.29 for a 24-ounce large. Jack in the Box is going with blackberry as the temperatures rise with the onset of summer. For a limited-time, Blackberry is being added to Jack's line up of real ice cream milkshakes. 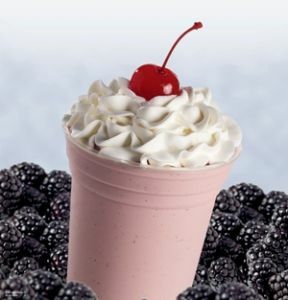 The new Blackberry Shake features real ice cream and blackberry-flavored syrup plus whipped topping and a Maraschino cherry on top. It is available served in a 16-ounce or 24-ounce cup for $2.69 and $3.19 respectively (may vary). In addition to the Colonel's Original Recipe, KFC also offers Extra Crispy Fried Chicken which offers a flavor that more like other fried chicken chains and is tinged with garlic and double dipped before frying to offer a crispy, crunchy texture. KFC is currently running a promotion where you can get 6 legs and/or thighs for $5 and a Sunday Bucket promotion where you can get 10 mixed pieces for $10. Arby's Jr. new Buffalo Chicken Sandwich is their value Jr. Chicken Sandwich played to the tune of Buffalo; that is with Buffalo sauce instead of mayo. The sandwich is similarly priced at $1. It's not on the menu on their website, so it's either regional or is being test-marketed. Popeyes is offering a "buy one, get one" promotion on their chicken dinners where you get a free 2-piece chicken dinner with the purchase of a 3-piece chicken chicken dinner. Not as sweet as getting a 3-piece dinner with a 3-piece dinner but still pretty good. 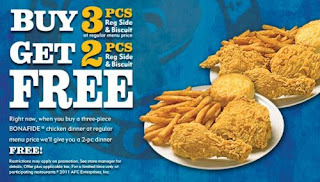 A 3-piece chicken dinner comes with 3 pieces of chicken, a regular side and a biscuit while the 2-piece dinner is the same except with two pieces. The promotion runs until May 29th, 2011 and is good at participating restaurants. It wasn't too long ago when Frito Lay got into the kettle-cooked potato chips game with Lay's Kettle Cooked Original Potato Chips where the chips are cut a little thicker and fried at lower temperatures in small batches to garned a thicker, crunchier chip. A 8.5-ounce bag retails for $3.49 but it's not unusual to find them on sale south of the $2.00 mark.